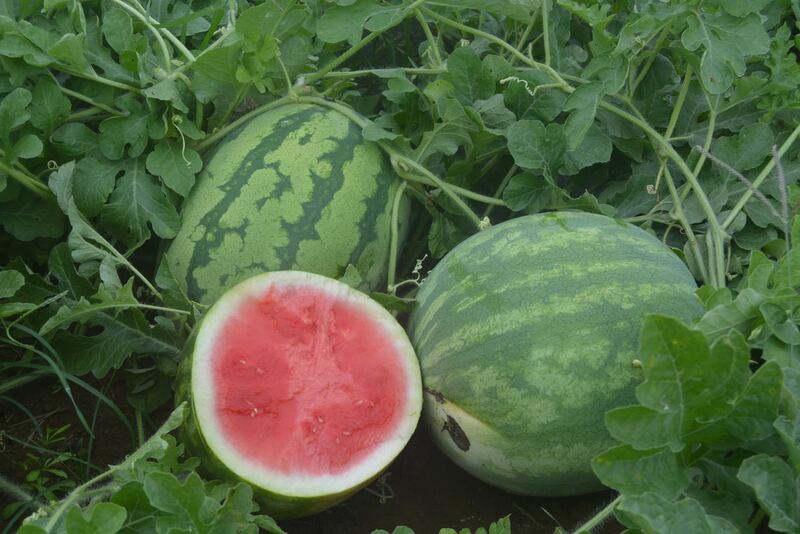 Organic watermelons are in season late summer through the fall. Deep red, juicy, super sweet, delicious are descriptions often given to us by our market and CSA customers; we would have to agree. Everyone loves watermelon. Yes? August and September of each year are the times when melons are in peak harvest. 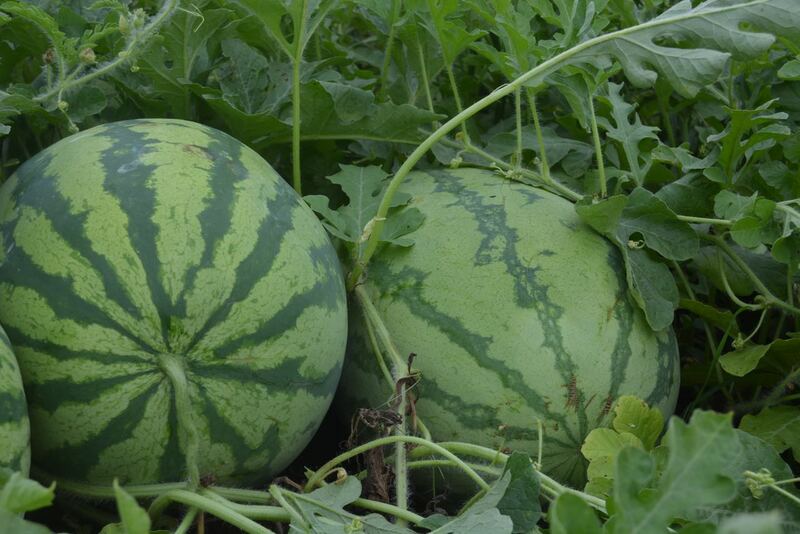 Seedless melons are our favorite but are the most difficult to grow as they are slow to germinate and require a pollinating plant. For this we plant rows of seeded, 30 lb watermelon every three row for cross pollination to the seedless plants. 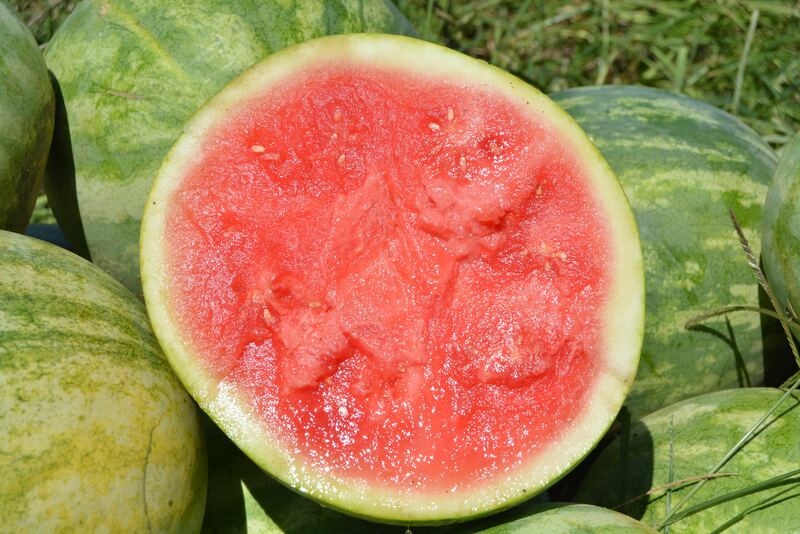 Most of the seedless melons are a 12-15 lb. fruit with an outer light green striping and juicy red center. The ample honey bees we have on the farm are critical to having a lot of melons set in the field. We will start the transplants in the greenhouse in early to mid June. The fields are prepared by spreading organic fertilizer, tilling, laying plastic beds and drip irrigation lines. Plants are translated on 30″ centers in the center of the beds. The low flow, low pressure irrigation system is turned on and the plants start to grow and spread. Depending on the rain (and this year we have had a lot), we will plow out the weeds between the rows one to two times. 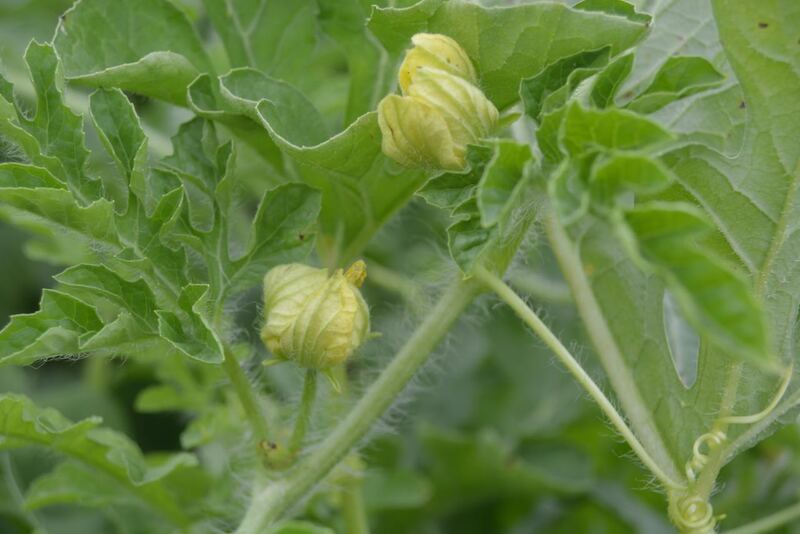 In one month’s time, the watermelons have covered the ground and small , yellow blooms appear. Melons are ready to harvest 80-90 days time. Harvesting the melons can be back breaking, heavy work but is the kind of work that gives you a feeling of accomplishment and progress. The watermelons all typically ripen at the same time in a given patch and all the melons are picked up by hand and placed into storage bins. 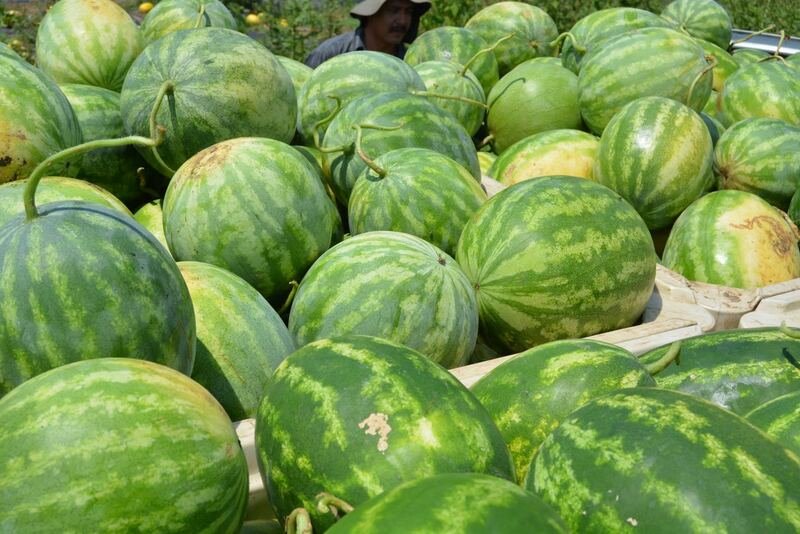 40-70 melons will fit into a bin, depending on the size of the fruits. I think it can safely be said that most people love a sweet watermelon. They are perfect for a family gathering, picnic, luncheon on the deck, kid’s school lunches or blending into a refreshing drink. An uncut melon an be left at room temperature, out of direct sunlight, for a week or more. Once cut, the melons should be sliced up, eaten or stored wrapped in plastic wrap in the refrigerator. 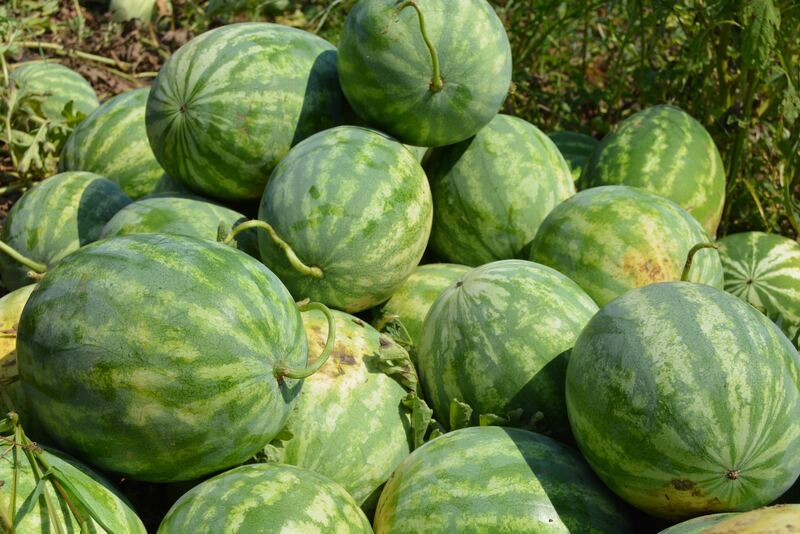 Best served chilled, the seedless melons can be cubed and stored in refrigerator for many days. This entry was posted in Organic Vegetables, Summer Crop and tagged delvin farms, fruit, local produce, melon, organic, seedless melon, watermelon on August 24, 2015 .